It’s that time of year! We’ve just passed Halloween, and Christmas is right around the corner. But, sloooooow down time, because there’s a wonderful holiday I love to celebrate in the classroom. That’s right, Thanksgiving. One of my favorite memories as a first grader myself is when our teacher held a formal Thanksgiving dinner just for our class. We all dressed up (I even have the home movie), and parents helped turn the music room (which was a modular building) into a magical Thanksgiving feast, complete with actual cloth linens and real silverware. I look back at that day in amazement and pure gratitude. Knowing what I know now about teaching, pulling that off could not have been an easy feat. If you are brave enough to try this with your class and have some parent volunteers willing to help, you should definitely try it. It’s one of my all time favorite memories, and some day I hope to recreate it in my own classroom. 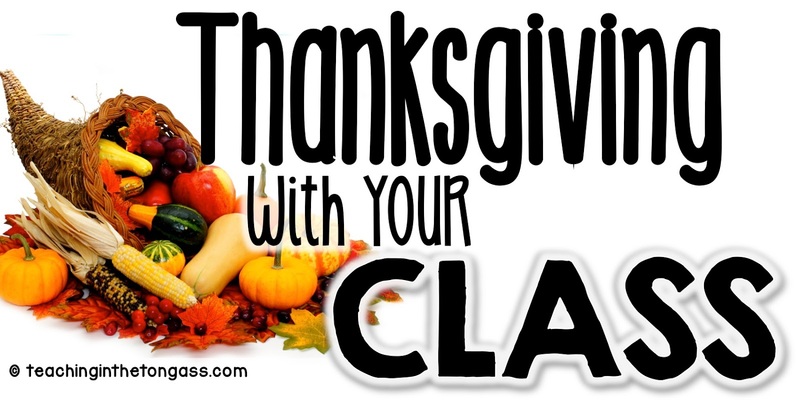 Until then, here are a few of my tried and true favorite Thanksgiving things to do in the classroom! This post contains affiliate links, which if you use them, provide me with a small commission that will allow me to continue writing content on this blog. When it comes to celebrating pretty much anything in the classroom, I’m all about easy. I like to make things fun, but I don’t want to spend my entire weekend prepping for it. My first year, I would have. But at this point, I cherish the weekends. I’m guessing you do, too. Here are just a few Thanksgiving activities that don’t require a lot of prep, but still have all the fun! The week before Thanksgiving, I like to give my students a Night Before Thanksgiving reader’s theater (you can grab it free here) so they can begin practicing. I’ve done this in groups, in pairs and a combination of pairs as a whole group and every year, it’s so fun to see how it turns out. If you’ve never done a reader’s theater, I highly recommend trying it. I am always so impressed with the growth they make from the first time they read it to when they’ve practiced for a week. You can keep it simple, or you can turn into more of a production with acting, it all depends on how much time you have! A fun way to kick off the month is to introduce the concept of gratitude. Many primary students don’t know what the word means, and it’s always important to connect vocabulary to real life experiences. I like to give students little cards of gratitude. It makes them feel extra special, doesn’t take a lot of effort on my part, and is inexpensive (something I’m aaaaall about). These ones are black and white and look great printed on colored paper. I also made them editable so you can even change the names and add your own personal notes to each of your students. You can get these editable and free Thankful Teacher Notes emailed right to you by signing up for my weekly newsletter below. Make sure to check your junk and spam folder if you don’t see an email from me within a few minutes. I also have these FUN Editable Color by Code pages that can be Thanksgiving Color by Sight Word, Thanksgiving Color by Number….you decide (that’s the editable part!) whether to use them for math or literacy, or both! Kids LOVE them and you are sneaking in learning and they don’t mind! I call that a win-win! They’re great for differentiating because you can have 3 different groups (or any amount of groups for that matter) using the same coloring page, but working on different things. For instance, you might use the turkey page and have one group working on finding the letter a, another group finding short a words, and another group looking for long a words. It’s that easy to differentiate. whether it’s “If I Were a Turkey” or “What I’m Thankful for This Year.” It’s editable, so it’s up to you! They’re simple cut and paste crafts so you don’t have your students wasting a lot of time tracing onto construction paper (your admin will appreciate that). And, what’s even better, this is actually a set of 80 crafts all bundled into one! 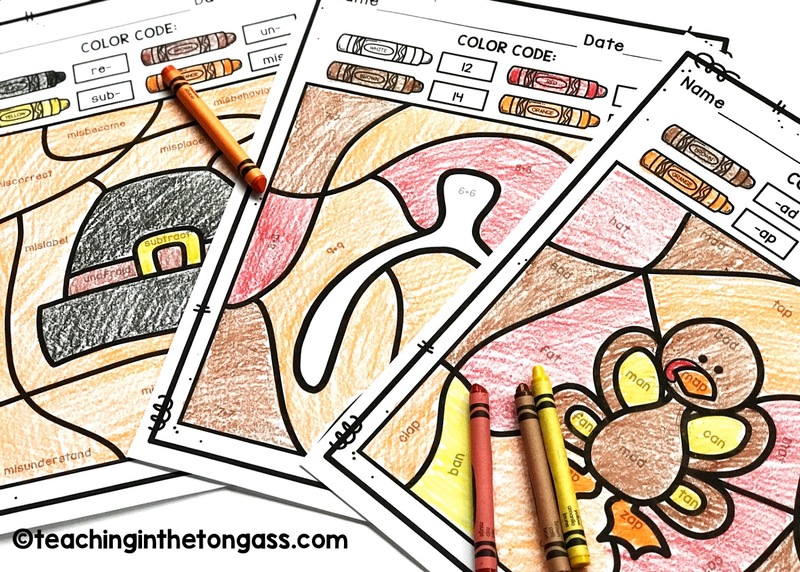 For instance, you get all 5 of these crafts for Thanksgiving, along with 75 more in the same resource. They can be thrown up on a bulletin board or sent home. I really like to keep Thanksgiving writing paper in a writing center during November. These ones are really simple and the borders don’t take up too much space, so the writing is what stands out on the page (my favorite part!). 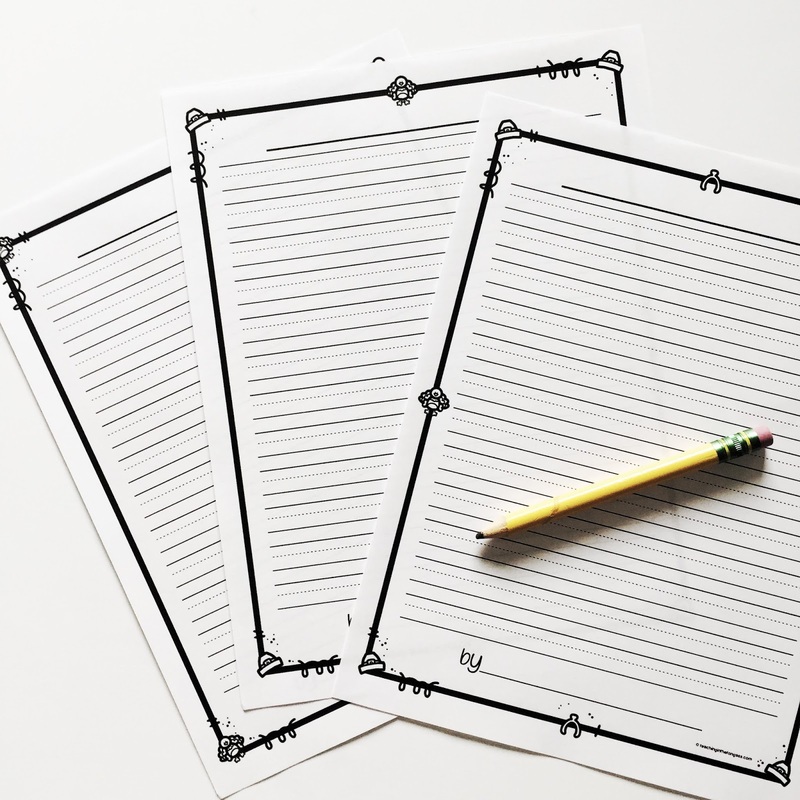 These are so great because they are blank, which means you can use them for pretty much any writing activity (yay!). You can add them to a binder, send them home with a homework assignment, or make them part of a writing portfolio. Get the free Thanksgiving writing papers here. I also have these Thanksgiving centers for literacy and math. My favorite activity is the “Gobble the Corn” where the turkey’s beak is a greater/less than symbol and students have to decide which corn card number is larger–so cute! This pack is perfect for the whole month of November and ideal for most Kindergarten, First and Second grade classes. It also includes an editable writing prompt with Turkey Craft so students can share what they are most thankful for–the turkey is a simple color and cut so it doesn’t take a lot of prep and students aren’t spending an hour cutting/glueing (who has time for that?!). You can see more of what’s included here. And we can’t forget about the read-alouds! I begin most of my months with switching out our book display and gathering my read alouds (I’m oddly protective over them haha!). Most students (and even adults) will take one look at this book and immediately think it’s about Halloween. But….it’s not! It’s a great transition book from Halloween to Thanksgiving (the pumpkin is actually a gourd, and he sits down for a Thanksgiving meal at the end). 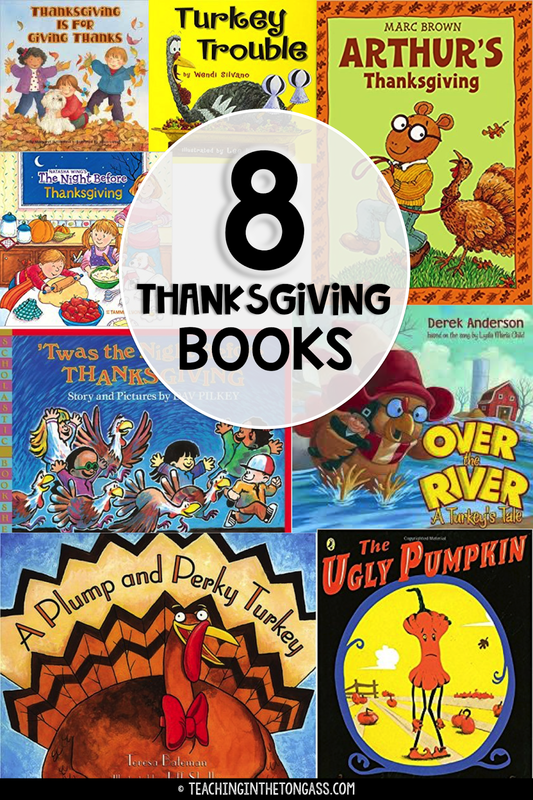 Here are a few more of my favorite Thanksgiving read-alouds. You can click on any of the books to see them on Amazon. So that’s it! 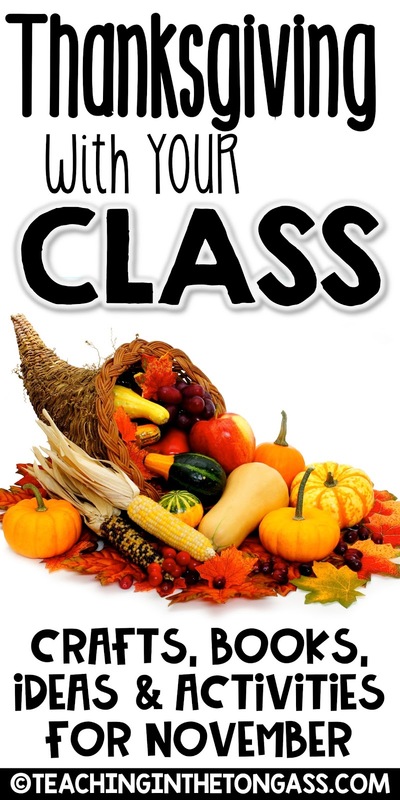 I hope you found something useful that you can do with your class to celebrate Thanksgiving. If you have any suggestions, feel free to drop a comment below! Subscribe to receive this FREE anchor chart, weekly teaching tips and MORE freebies delivered right to your inbox! Success! Now check your email to confirm your subscription and download your freebie.